The one thing about judging poetry is that it often takes me much longer than I expect. For everyone who has waited so patiently for me to get these results together, thank you for that patience. It is appreciated. Also appreciated: Thank you so much to everyone for participating in the Remixing the World's Problems challenge! I received nearly 300 remixes of the words in Solving the World's Problems, which totally blows my mind! I still remember having the idea during one of my 500-mile drives up to Ohio and wondering if anyone would really be game for such a thing. I guess I shouldn't have worried, right? Of course, it probably helps that there was a $500 prize for my favorite remix! Choosing the winner was not an easy process for several reasons. First of all, it's disorienting to read remixes of your own words. It's exciting, but it's also kind of...well...weird. Beyond that, it's like having grandchildren in a way--seeing all these offspring of my offspring (err, original poems). Picking favorites among my own poems is difficult, doing so with grandchildren is just as difficult. Plus, y'all came at this challenge with a lot of creativity! One poet remixed every poem in the collection as a tanka. Another used the final word from each poem to construct a new poem. A few poets used the poem titles as source material. Some took the original poems and fit them to fixed forms, including a sevenling, pantoum, fib, triolet, sestina, and others. A handful of poets did erasures. One poet submitted a couple image-based poems. Throughout the judging, I encountered incredible energy and interesting processes. In a way, it was like an advanced level course in the possibilities of revision and re-creating poems as something new. The winner of the Remixing the World's Problems challenge is Jane Shlensky for her collection titled simple solutions. In her entry, Jane remixed every single poem in Solving the World's Problems to create an entirely new manuscript, a sister manuscript if you will. Here's a little of what she said when she made the submission, "Remixing has forced me to study your work and to emulate the power of its short lines and images. ... Win lose or draw in this remixing challenge, I've already won a new world view and a darned good education in poesy." 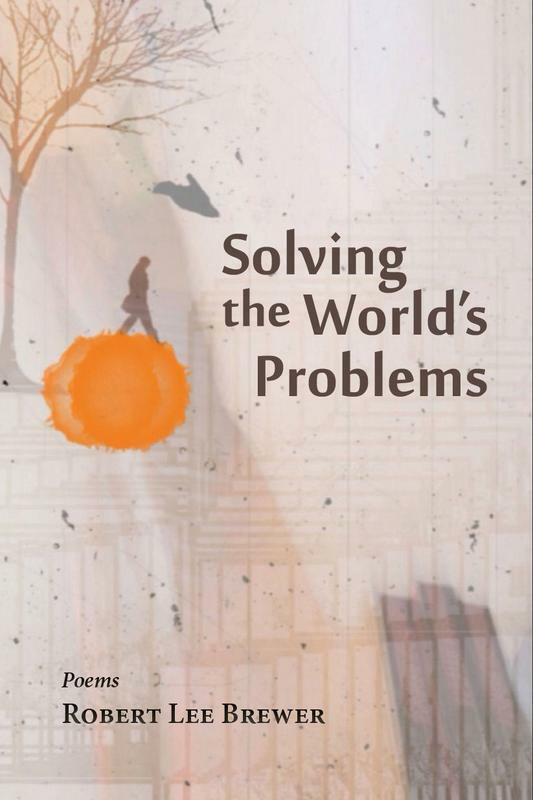 First of all, a collection titled Solving the World's Problems is bound to appeal to teachers and optimists who believe such solutions are possible. Robert's poems, so very different in form from my own, were amazingly similar in their themes. The order of his collection helped to open up broader questions, it seems to me, and emphasized for the interaction of the self and the world, the micro and macro, and that attracted me. Also, Robert has the ability to say so much in so few words, to engage huge (dare I say global?) questions with single lines or images. Reading his poems closely, I saw how he tapped into his upbringing, observations, experiences, definitions, and loves, just as so many of us do. Studying his work was somewhat like another form challenge. I love playing with forms. The remixing process required multiple readings for me, close analysis of what worked in each poem, and often multiple attempts to write a remix of some of those poems. My poems are wordy and longish, often narrative; sometimes I tinker with meter and rhyme or blank verse. It really was a challenge for me to condense my meanings to single images, to "squeeze the universe into a ball," as Eliot's Prufrock says. After a dozen or so tries, I got the hang of saying what I wanted in a similar form and found that the conundrum of solving world problems was in channeling Robert--and then rewriting and editing for a few weeks. It was very freeing to dispense with punctuation and capitalization, the trappings of grammar and freeing to be in another poet's head for a while and out of my own. Plus, I learned a new way of expressing myself by remixing Robert's work. One thing Jane left out is that she actually published a few of her remixed poems in a journal titled Prairie Wolf. She described it as "the only reward I thought I would receive," but, of course, that's not the case. Read them here. With so many great entries, I could not stop at just a winner. I also want to recognize the top 20 finalists. If your entry did not make the list, it probably had nothing to do with how much I enjoyed the remix; it's just, well, I had to make tough decisions. "Origami Kisses," by Martin Willitts, Jr.
Congrats to everyone who was a finalist! And again, thank you to everyone who participated! This was truly an incredible adventure. As I relayed to our winner earlier, I'm in the process of trying to shop around an anthology of some of my favorite remixes, including ones that may not be on the finalist list. I have a plan for creating a remix anthology that doubles as a guide to the possibility of revision. We'll see how that goes, and I'll keep everyone updated if there is any progress on that front.